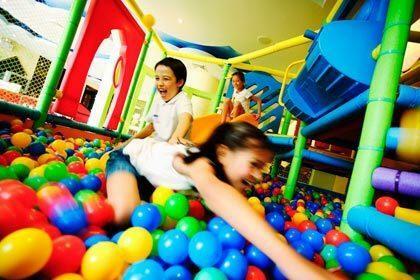 The Movenpick Phuket kids club is the biggest on the island. It is a blessing for parents who can leave their precious angels in the capable care of the resort's professional staff and be a kid again them selves and have their hands free to shop, explore the many restaurants or go on sightseeing trips. 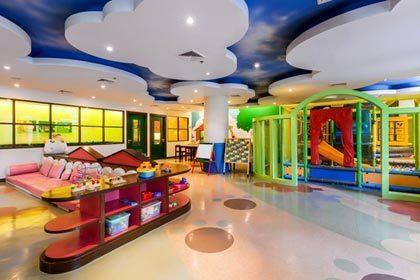 Movenpick's Play Zone offers a vast array of entertainment options for children from 4-12 years old which is healthy, educational and fun. This include sports activities such as kids aerobics, yoga, stretching and a kids world cup. Cultural activities includes Thai dancing, the little chef cooking school and Thai arts and crafts such as painting, jewelry making and fancy nail art for the girls all within a dedicated child-safe play area. The kids club is open from 09:00 am until 19:00 pm every day of the week and caters for children from 4 years and up to 12 years of age, and entrance is free. But do not be concerned if yours are still in diapers and younger than 4 years. At a nominal fee they will be accompanied and cared for by one of the resort's trained staff. Besides these facilities this family friendly Karon Beach resort in Phuket also offers 2 kids pools and water slides while mom's and dads can relax at the pool bar. The activities which have an ♦ carry a charge. Please check directly with the hotel for further information. Entrance for children is free of charge. Opening Time is 09:00 am.